Rajasthan is one of the largest states of India which covers the lakes, desert, wildlife, and heritage attractions in its landscape. 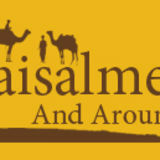 Royalty is a synonym of Rajasthan which is well-displayed in its nook and corner of the state. Along with the royalty, culture, architecture, and magnificent beauty are widely expressed in Rajasthan. The royal state owns the heart and soul of every travel enthusiast in the country. Interesting rituals, traditions, ethnicity, and charisma of festivals of Rajasthan is a must experience thing in the state. Enjoying a Rajasthan holiday without getting indulge in the rituals of the festival remains incomplete. 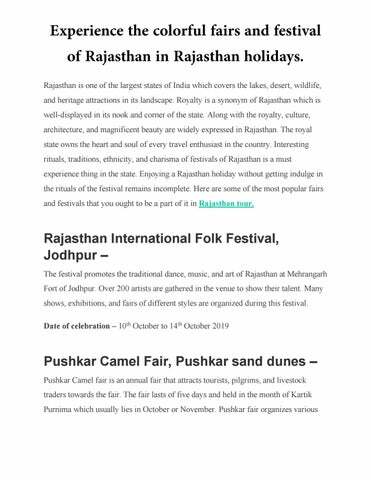 Here are some of the most popular fairs and festivals that you ought to be a part of it in Rajasthan tour. Teej Festival, Jaipur – Teej is celebrated throughout the state however this festival is commercialized in Jaipur. There are many ways of celebration which mainly involves native women. Street procession of the goddess takes place with thousands of devotees dancing around the Chariot music, bands, and much more. Date of celebration â&#x20AC;&#x201C; 3rd August 2019 Apart from the above, the state organizes many other festivals which you can enjoy like World Sufi spirit festival of Jodhpur, Urs festival of Ajmer, Elephant festival of Jaipur. The state is all about celebrations, rituals, customs, cultures, traditions, and many other things which ensure a wonderful travel experience in Rajasthan.